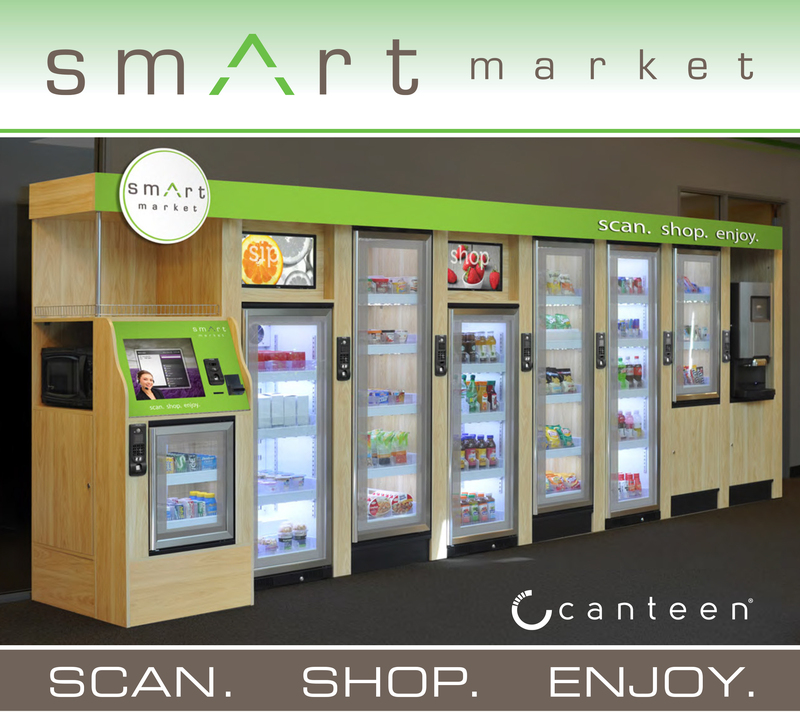 Canteen, the nation’s preeminent vending services company, is thrilled to bring Smart Market to the CPCC Cato Campus, Cato III building, next week! Smart Market is a completely secure, unattended self-checkout market. What makes Smart Market unique is its completely secure access. Smart Market has the ability to control access to products – while still allowing customers to browse and select only those products they wish to purchase. The system will only charge you for what you walk away with – it’s simple, safe and secure. Each market is composed of a central kiosk and a bank of refrigerated coolers and cases that display fresh food, snacks and beverages. Patrons will simply scan, shop and enjoy! Cato III’s Smart Market is tentatively scheduled to open April 19 and will serve the campus’s staff, students and guests! See how Smart Market works. Construction for the Taco Del Mar and S’barro Pizza restaurants on Central Campus is underway. The target date for the grand opening is Monday, Feb. 29. In January, food trucks will be on Central Campus the below dates and times. Food trucks will be staged at the corner of Pease Lane and Elizabeth Avenue. 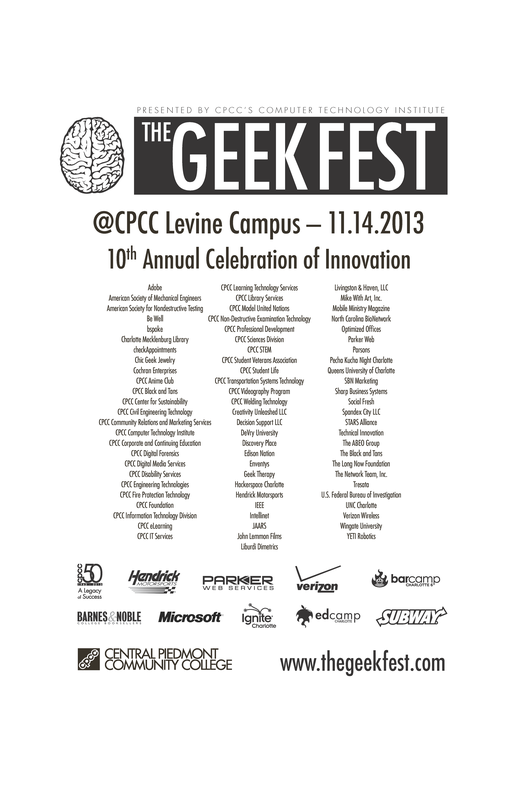 THE Geek Fest, a celebration of innovation and technology, is coming to CPCC’s Levine Campus on Thursday, Nov. 14 and will feature the latest in technology, innovation and professional opportunities. The greater Charlotte community is encouraged to participate in this free event. Attendees will interact with exciting new technologies, meet innovative companies and learn from industry experts. This year’s event will highlight a variety of exciting topics, including launching a startup business, product development, social media, programming and software development, animation, automotive technology, engineering, mobile computing, instructional technology and much more. Activities will include guest speakers, an exhibit hall, demonstrations, activities, video games, music, contests, food and door prizes. Don’t miss this must-attend event that will inspire you to discover – and embrace – your inner geek! 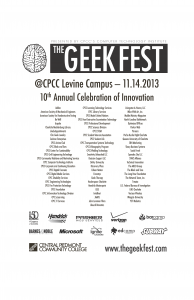 WHEN: Thursday, Nov. 14, 9 a.m. – 3 p.m.
WHERE: CPCC Levine Campus, 2800 Campus Ridge Rd., Matthews, N.C. CONTACT: To learn more about THE Geek Festival, please visit http://www.thegeekfest.com. 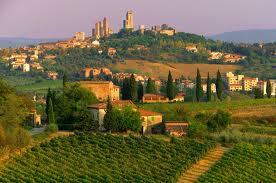 Clay, Food & Art History: Two Weeks In Tuscany! CPCC teacher and ceramics sculptor Paula Smith, and Winthrop University art historian Laura Dufresne are leading a spring trip to La Meridiana International School of Ceramics in Tuscany. Students from novice to advanced will explore the medium of clay as well as lectures, trips to art historical sites, museum tours, wine tastings, great food and the experience of a lifetime. The cost of the trip is about $2,760, not including airfare. For more information about this incredible opportunity, contact info@lameridiana.fi.it. CPCC International Spring FestCPCC’s International Spring Fest will take place on Wednesday, April 18 from 10 a.m. - 2 p.m., in its NEW location, the Overcash front lawn. The weather continues to look like a certain wash-out Wednesday, so CPCC has decided to move Springfest to Thursday, April 19, 10 a.m. – 2 p.m., on the Overcash lawn. While the date has changed, the event will still boast the same features and schedule of events. International countries will have tents with displays, flags, traditional dress and information about their country. Campus clubs and organizations will also be giving out information and selling various items so remember to bring your cash! There will also be live entertainment! Yasmine and Magic Hips (Belly dancing), noon – 1 p.m.
Polynesian hula dancing and fire/knife display, 1:15 – 2 p.m.
Basketball and sumo-wrestling inflatables will also be available for fun! Student Government Association candidate speeches will take place at 1 p.m. Online voting at the SGA tent will be available.